I remember you daily although I was too young when you were murdered to have any memories of you. Your hand has been on my shoulder every day, guiding and protecting me. You are always in our thoughts and prayers. You and the sacrifice that you made will never be forgotten. We know that you are always watching out for us. Yet another year has passed since you were taken from us. You will never be forgotten. Not a day goes by that I don't think of you. I know that you are watching down on all of us and are my Guardian Angel. Your family remembers you always and wishes that you had been here to meet your grandchildren and great grandchildren. You are in all of our prayers and know that you protect us daily. You are always with us and forever in our memory and prayers. You have been my role model throughout my entire life. I pray for the solace of all those that love and remember you for I know both the pain and pride are forever. Thanks to your family for sharing their devotion to you through their reflections. We all miss you and are forever in our prayers. We all miss having had the opportunity to know you but you are with us always. We will never forget you or the sacrifice you made to protect your fellow man. We know that you are watching over us every day. Although it's been 61 years since we lost you, you are still loved and missed by all of us. Thank you for guiding your letters to us, I am able to read a few each day and am getting to know you through your letters. On today, the 60th anniversary of your death I would just like to say thank you for your service and sacrifice for the citizens of Abington Township. And to your family and loved ones, I wish to extend my deepest sympathy. It took another 4 years, but your murderer got the justice that he deserved. It was 60 years ago today that you were taken from us. We miss you but know you are watching over all of us from heaven. The memory of you and your sacrifice will never be forgotten. Rest easy officer Mathews; your service is remembered by both your fellow officers and family. earned wings to join St. Michael's Heavenly Police Patrol. Even after all these years your service and sacrifice are remembered. I, as well as my family, would like to thank you for posting this tribute to my dad. I was only two years old when he was taken from us. Although I was too young to have any memories of times we spent together, he is always in my heart and mind. He would be proud of his four grandchildren and ten great grandchildren. Our appreciation also goes to the Abington Township Police department, especially Lt. Dennis McCauley and Officer Lew Clewel, for their dedication in recognizing my dad and his sacrifice. Your sacrifice is one that will never be forgotten sir. Rest in peace. 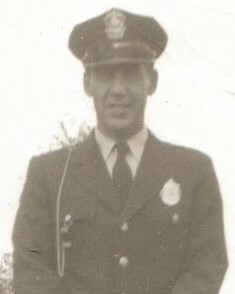 Officer Thomas Mathews was a well-liked and respected member of the Abington Police Department who was brutally gunned down on June 29, 1949 by a buglary suspect who was ultimately given the death penalty. On June 29, 1999 - fifty years after his death - the Abington PD held a memorial service in his honor. It was attended by his wife, son, and many officers. A beautiful bronze plaque and a magnificent bronze sculpture (entitled "service, sacrifice, and honor") stand in front of the Abington Police Department, serving ongoing memory to our fallen brother, as well as the other members of the Abington Safety Forces who have died in the line of duty. His memory will again be honored on June 13, 2006 as the APD celebrates it's 100th Anniversary. Your memory will not be forgotten!